The only foodstall at Falchi’s celebrating the Super Bowl winners was Don Tapas, who served clam chowder in the Patriots’ honor. That’s cool, but I don’t like clam chowder…but their new special, the Greek Chicken bowl, sounded interesting. Another interesting thing opened up next door to Don Tapas: Sans Bakery! This bakery has gluten-free items, some of the goods are vegan. I wanted to dip in only with my toes (at first), so I ordered a brownie bite for $1. 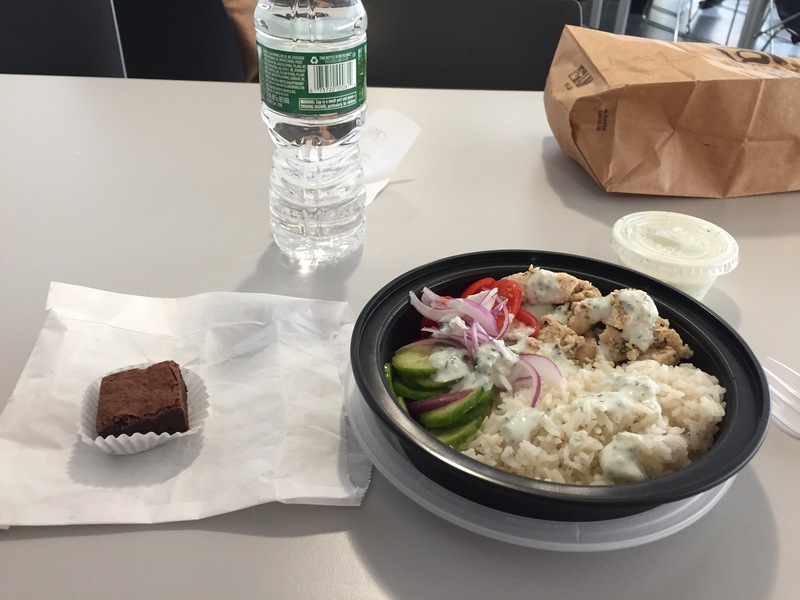 Main course: The Greek Chicken bowl contains chopped grilled chicken flavored with oregano, sliced English cucumber, grape tomatoes and red onion, white steamed rice with a side of tzatiki sauce. I’m sorry to say, but the sauce killed the dish; it was way too garlicky, sour and gloopy. Also, the chicken was too dry and well-done. At least the veggies and the rice were nice. Dessert: Good chocolate note-ratio, though I do like brownies to be fudgier, this was very dry. I don’t know if that’s because of the flour’s absence. All in all, not a bad way to start out another workweek.